When a decal is printed (not die-cut from a single color vinyl roll) you have a couple of options on what type of vinyl you would like the ink to be printed on. Below is an explanation of the choices you have. Note that just because the images below show the material in white, this does not necessarily mean that your decal will have any white on it. Most decals are cut around the basic shape of the design so we can print over any white areas if needed. Standard GLOSSY Vinyl (4 Year Material - Unlaminated ink will last about 3 years) - This is the most popular choice for most customers. Material is a glossy white vinyl with special channels in the adhesive that allows air to more easily escape than regular vinyl. This makes it easy to work out air bubbles and wrinkles on decals that have large solid sections. The decal will have a photo glossy finish and is conformable to most simple curves. Matte shown on the right for reference. Glossy REMOVABLE Vinyl (4 Year Material - Unlaminated ink will last about 3 years) - This is essentially the same as our Standard Glossy Vinyl above but can be removed easier (though the decal can not be reapplied since it will be destroyed upon removal). This material is NOT recommended for high traffic decals as vandals can easily remove the decal. Matte shown on the right for reference. Standard MATTE Vinyl (4 Year Material - Unlaminated ink will last about 3 years))- This is used if you want the finish of the print to be "matte" or "chalkboard" like. This will leave the surface a NON-glossy finish and is conformable to most simple curves. Note that black will not be as dark as a glossy black when using this material; so it can appear very dark gray. Glossy shown on the left for reference. Premium WRAP Vinyl (7 Year Material - Unlaminated ink will last about 3 years))- This is a glossy white vinyl with special channels in the adhesive that allows air to more easily escape than regular vinyl (see image). This makes it easier to work out air bubbles and wrinkles. It can be stretched quite easily especially with a heat gun. This is the material the vehicle wraps are typically made from. Works best on complex curves such as automotive panels with with extreme curves, motorcycle gas tanks, helmets, etc. There is a 90% premium added to the price of the decal for this vinyl since lamination must be used in conjunction with it. The glossy finish can be made matte by choosing a matte laminate. Should not be used on small detailed design since it isn't required and doesn't cut fine detail well. Extreme Adhesive Vinyl (7 Year Material - Unlaminated ink will last about 3 years) - This vinyl has a Satin Finish (in between Glossy and Matte). It is designed to stick to low friction surfaces that most vinyl will not adhere to. This includes rough wood, bricks, concrete, etc. Also works well on coolers that has slight texture that most decals will not adhere to. Or ATV/UTV/Snowmobile/Motocross bikes due to it's extreme grip. Finish can be made glossy or matte by choosing the appropriate lamination when ordering. There is a 50% premium added to the price of the decal for this vinyl. Premium REFLECTIVE Vinyl (7 Year Material - Unlaminated ink will last about 3 years))- This is a glossy vinyl that makes the decal reflect at night when indirect light shines on it. Whites will not appear pure white as this vinyl has a slight pearl-silver tint to it. It will make ALL colors appear to be printed with metallic ink. This vinyl is approximately 3 times thicker (6 mils) than the other vinyl offered so it does NOT conform well to complex curves. This should be used mainly on flat surfaces or those with very little curvature. There is a 50% premium added to the price of the decal for this vinyl. 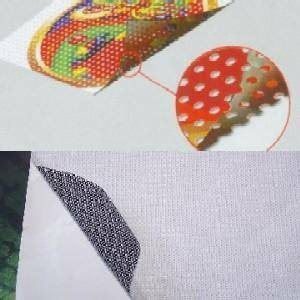 This material has a very strong adhesive to it which makes have similar adhesion properties as our "Extreme Adhesive" material above. Flames shown on left: The top picture shows the image in low light while bottom picture shows the decals with a flash. Standard CLEAR Vinyl (4 Year Material - Unlaminated ink will last about 3 years) - READ CAREFULLY BEFORE CHOOSING THIS OPTION. This vinyl is totally clear. Note that all ink for printing is designed to be used on a white vinyl. 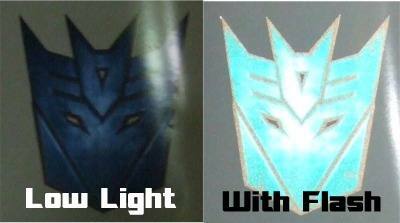 So choosing this option will make the colors of the decal not appear as shown. The surface color you are applying the decal to will have a great effect on how colors will look as the ink itself is not totally opaque. It will make the design appear similar to that of a "ghost flame". This can caused standard colors to appear washed out unless applying it to a white background (in which a white vinyl should be chosen). See this page for more information. This clear vinyl is mainly used in conjunction with solid, dark inks such as black. Please email with any questions you may have before you choose this option. This vinyl leaves a glossy finish and conforms well to most simple curves. 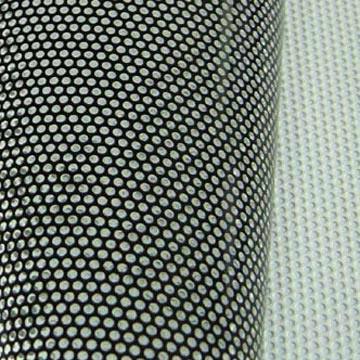 Perforated Window Film (1-2 Year Material) - SPECIAL ORDER. Works great for LARGE solid decals that go on a window that you need to see out of. This decal goes on the OUTSIDE of the glass. Adhesive side is black for better vision. Lamination can be added for extra durability of several more years. Decal design MUST be a solid shape design withOUT any type cut-outs so most of the designs on the site will have to be modified in order to use this material. So be sure to check your email if you choose this type of material when ordering because a choice may need to be made on how you wan the decal to be designed. EDGE WILL APPEAR JAGGED since there are holes in the material. Top Picture - Shows back side (black with adhesive) and front side. Middle Picture - Shows how a print looks up close. Bottom Picture - Shows how a whole back window is covered. Can be laminated to add 2 years extra of durability. This also helps keep water out of the holes in the rain which leads to better visibility. Static Cling (1 Year Limited Durability) - SPECIAL ORDER Looks like regular gloss vinyl but has no adhesive. Please note that your design will be modified to work as a static cling vinyl. The decal will be cut as the basic shape of the decal and will have about a 1/4 inch white border around the edge. All white areas within the design will remain white and will not be cut out like a traditional die-cut decal. Due to the static nature of this material, some dust particles may be sucked into the ink during printing. This is normally minimal but it does happen so solid colors may not be "perfect". On designs that have 27 inch as the largest size listed to order, 25 inch will be the largest available for this material. Sticks well to windows, painted surfaces, fiberglass, or any smooth/clean surface. Critical that the surface is clean before installation. NO ADHESIVE; relies on static to hold the decal in place. Install WET for maximum adhesion. Squeegee out excess water after installing. Die Cut Example and an example of the same decal converted into a Static Cling decal. The thin gray line is the shape of the decal. Wall Vinyl - This material is used for large wall graphics similar to those made by FAThead®. Material is THICK (6 Mils) and can be removed and reapplied since it has a very low adhesive. Decal will stick to any smooth clean surface such as painted wall, glass or finished wood surfaces such as doors. It is NOT recommended for textured surfaces, unpainted drywall, outdoor walls, vehicles or bricks. If you have recently painted your walls do NOT install the decal for at least 30 days to allow the paint to fully cure to prevent damage. All decals printed on this material will have a white border around the image that is approximately 0.25 inch thick; this prevents the edge from curling. ***Note that this style decal will not work on a lot of new paint since paint manufacturers are now adding promotorers to the paint to make them less sticky for easier clean up. To test, stick some normal "painters tape" to the wall. If it comes off easily you can not use this type of material. You will need to use a material with a more permanent adhesive. Die Cut Example and an example of the same decal converted into a Wall Vinyl decal. The thin gray line is the shape of the decal. Glossy 3D Dome - Only availble in packages of 125+. Domed decals are "emblem like" that have a 3D dimension to them. This also adds extra protection to the decal as it is similar to having extra thick lamination. 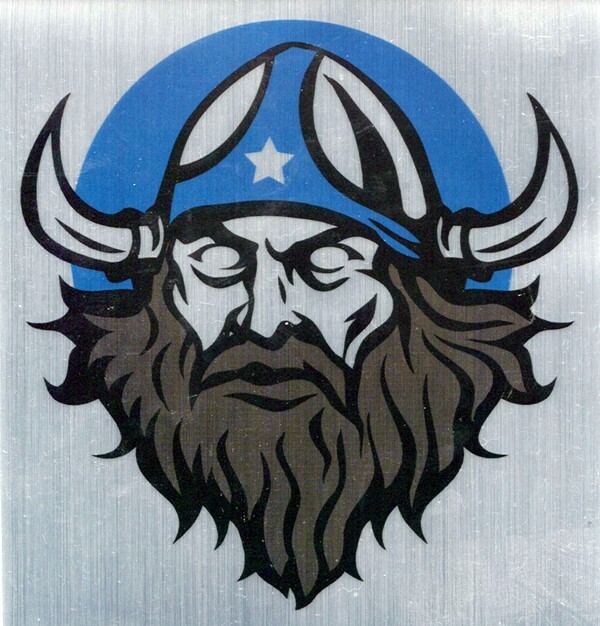 Please see our Domed Decal Page for more information and images. Please note that approximately 5 days extra is required for production of domed style decals. Lamination - This is a second layer of clear material that is installed after printing but before die-cutting. This extra layer helps protect against the elements. Even though our inks are designed to last about 3 years in outdoor conditions, they can be venerable to harsh chemicals (such as gasoline). Lamination protects them against this along with extending the life of the decal by several years. Available in Glossy or Matte finish. Glossy will add extra shine to the decal like a clear coat does to paint. Matte will tone down the glossiness to a matte finish. Metallic adds a metallic look to the decal. See the Lamination Page for more information. Simulated Metals - look like real metal. This includes Chrome, Diamond Plate, Gold Mirror and Brushed Aluminum and Oil Slick. Note that white is NOT printed so any white within the image is going to be the color of the material. Since our inks are semi-transparent colors printed on this material will appear as tinted shades of it and bright colors do not appear as bright as when printed on white material. For this reason it is best to use darker color inks with simulated metal. All material is laminated for extra durability. See our printed color chart for examples. 22" in max size on shorter dimension for some of these material choices. Also see our die-cut color chart for more pictures of this type of material. These will come as 2 decals (either a right and left side or a top and bottom). This allows for single person installation and the decal will slightly overlap at the seam.